Madewell is one of the brands delighting me most these days and right now you can take an extra 30% off its sale, including new markdowns and special collections! I’m excited to use this special offer to fill out my winter-to-spring transition closet. Pleated Tank Top (now $70 + 30% off): This top has beautiful movement that makes it ideal for your day-to-night transition. I adore the ‘coastal orange’ color, which is red in real life. I’d wear this with a pair of dark blue or faded black jeans under either a faux leather jacket, a faux suede moto, or my favorite denim jacket. Elevate the look with a pair of comfy heels and aviator sunglasses. Velvet Baseball Cap (now $15 + 30% off): With winter slowly ebbing, velvet is mostly being tucked away til next year. This cap is a great way to keep a trend I love extending longer into warmer weather. Silk Cold-Shoulder Ruffle Dress (now $50 + 30% off): Freshly back from vacation, I’m so ready to wear warm weather dresses! This one will look great with cute sandals and a denim jacket. Not quite ready for cold shoulder yet? The Silk Flutter Hem Dress in Star Mix (now $100 + 30% off) is another great choice. In addition to these faves, you’ll find lots of Madewell’s collabs have hit sale too. I was shocked to see select sizes of the Karen Walker Silk Pandores Tie Dress (now $300 + 30% off), Ulla Johnson Silk Farrah Printed Midi Dress (now $400 + 30% off) and Madewell x No. 6 Silk Beacon Dress in Garden Bouquet (now $70 + 30% off) available and not excluded from the promotional offer! I also noticed that Madewell is carrying a few of my favorite weather boots, like the rain or light-snow ready Sorel Out and About Boots (now $90 + 30% off) and Out and About Chelsea Duck Boots (now $80 + 30% off). I’m also quite fond of the Treton Nylite Plus Sneakers in Leather and Velvet (now $55 + 30% off) and the Madewell x Vans Old Skool Unisex Sneakers in Suede and Sherpa (now $50 + 30% off). Many more picks below in the shoppable boutique — what’s been good for you at Madewell recently? Sorry about the O/T but just wondering if anyone still has an Anthro 20% off mail code they won't be using? Soleil, do you still need a code? I can email one to you if you do. Try this one. It should work since I just got it as a reminder this morning from Anthropologie. I also got a pair of Roadtripper jeans from Madewell for Christmas and they are the BEST! So, so comfy! So fun! 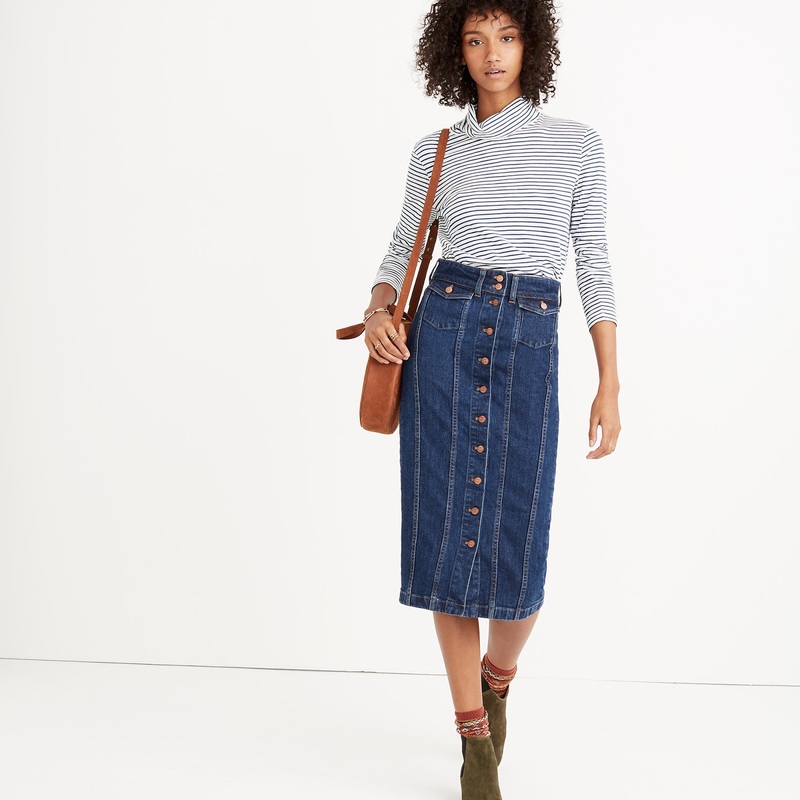 I love Madewell's jeans so much, though I haven't tried the Roadtrippers yet. I have seen the Drawstring Crossbody in person and it closes up real tight, I can't imagine things would fall out unless the closure is pulled loose inadvertently. OT – Sundance has a promo of extra 30% off outlet this weekend. There are a number of new markdowns. Madewell is my go to store these days. I have ordered a number of things from them this past Fall/Winter. Loving them more each passing day! Have never tried their jeans though. How does it fit for someone with curves? I find Madewell's jeans are very curve-friendly! Most of them have at least a bit of stretch and this season they just unveiled a new material devoted specifically to curvy gals called ISKO, which helps the jeans stretch in the parts we need it without sacrificing overall quality of fit. I'm VERY excited about it and looking forward to collaborating with Madewell again this Spring on some new OOTDs! If you check out their denim page, you'll see they're now showing a model wearing two of the fits in a size 32. No big deal, no press around it, just naturally incorporated into their model rotation! They're using 3 "Plus" size models now, and I love it! Of course 'Plus' in the model world equals about a size 8-12 in the real world, but hey, it's progress! !